Since its original incarnation in the Netherlands in 2010, The Voice television singing contest has become a global phenomenon with 39 different countries currently broadcasting their own versions of the franchise. 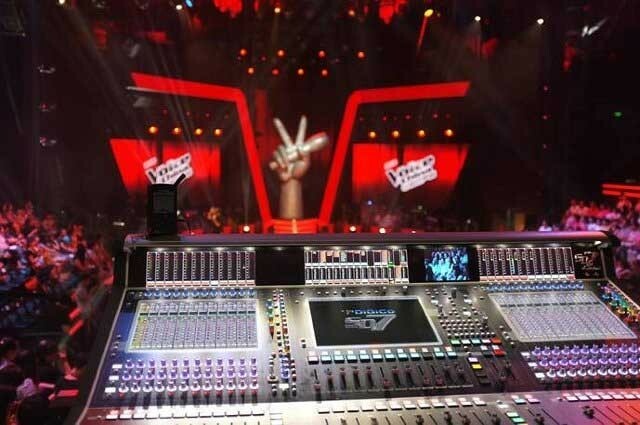 Now in its second season, The Voice of China features two DiGiCo mixing consoles. With an identical format to the other incarnations of The Voice, the show is broadcast on Zhejiang Television between July and September. Its head of sound is Jin Shaogang, one of China’s leading live audio engineers and revered in the country for his role at the opening and closing ceremonies of the 2008 Beijing Olympics. Naturally, the sound production’s most important task is to make the contestants sound as good as possible, so Jin Shaogang specified an audio system which includes a DiGiCo SD7 at Front of House and an SD10 on monitors. Complemented by two SD-Racks and a Waves SoundGrid system, the equipment was supplied by DiGiCo’s Chinese distributor Rightway Audio Consultants. With The Voice of China being one of the country’s most popular entertainment shows, the SD7’s Stealth Digital Processing ™, dual digital engines and power supplies deliver the required optimum audio quality and reliability. It is already a popular choice for many large format Chinese live and broadcast applications, having featured on such prestigious projects as the 60th Anniversary National Day parade. On monitors, the SD10 ensures that every note is flawlessly captured, significantly helping both the contestants and judges to deliver the best performance on every show. To ensure that the programme’s audio team got the most from the consoles, DiGiCo and Rightway Audio Consultants organised a four-day training session before the series began. The comprehensive, hands-on programme included everything from basic operation, setting up the optical network and sharing the SD-Racks through to advanced functions, working with Waves plugins and recording live audio via the consoles. "As the signal paths were processed at 96kHz this time, very high resolution audio processing was achieved," says Jin Shaogang. "The live sounds is exquisite, with solid bass, high clarity and accurate phrasing." "The first series of The Voice of China captured the imagination of viewers, so the second series was keenly anticipated," adds Rightway’s Danny Lau. "Series Two is proving even more popular than the first. We are very pleased to supply DiGiCo consoles for such a popular production and are grateful to DiGiCo UK for their help in delivering a comprehensive training programme, which has helped our engineers provide first class audio."